State-of-the-art logging equipment, a successful high school forestry career day, informational seminars and workshops, and social networking opportunities were just a few of the highlights at the recently concluded 80th Annual Oregon Logging Conference. Taking place at the Lane Events Center and Fairgrounds February 22 – 24, 2018, the OLC attracted more than 6,000 industry professionals from 37 U.S. States as well as Australia, Canada, Finland, Japan, New Zealand, Russia, and Sweden. The weather was somewhat of a challenge, but did not deter from a successful outcome. The main weather impact was the cancellation of the Thursday scheduled elementary school tours at the conference. According to OLC Manager Rikki Wellman, this is only the second time in her 46 conferences that the school tours have been cancelled. The first Future Forestry Workers Career Day, sponsored by the Oregon Logging Conference Foundation, was a huge success on Friday, February 23rd. More than 400 students from approximately 20 high schools attended the career day, learning about current and future job opportunities in the logging industry and the skills required for each job. The students also got to get up close to modern day logging equipment, visiting one-on-one with industry professionals, and hear from those in the industry. Nearby the career day activities were other hands-on educational activities, and then on Saturday, high school students from Tillamook, Sweet Home, and Scio participated in the annual High School Skills demonstration. The Oregon Logging Conference Foundation (OLCF) auction, held both Thursday and Friday mornings during the opening breakfasts, brought in over $20,000 to support college scholarships for up and coming industry professionals. Thank you to all the donors of items and to all who bought items, for supporting the OLCF education programs. 2018 OLC President Rick Kriege, in his presidential message he addressed the theme; 80 Years Evergreen and Growing. He provided a brief history of the three founding industry leaders; Archie Whisnant, Col. Greely and Herb Cox, who blended their points of view that led to the beginning of the Willamette Valley Logging Conference. 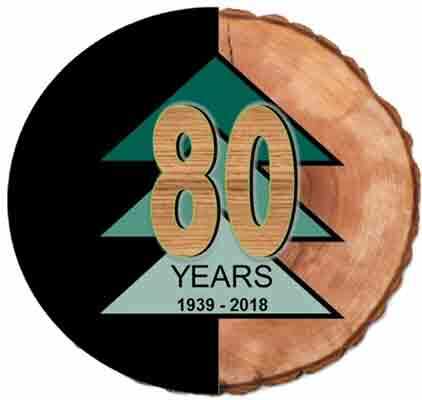 As the conference grew the name was changed and now 80 years later the Oregon Logging Conference continues to be the largest equipment show west of the Mississippi. As he addressed the Evergreen portion of the theme, Kriege said, “We plant and grow more trees than ever in today’s practices, we have adopted policies that protect our future to stay Evergreen”. Keynote Speaker Kathy Abusow, President & CEO of the Sustainable Forestry Initiative, spoke to a standing room only crowd at the Oregon Logging Conference. Her key message was that all the hard work that goes into logger training which is recognized by SFI Implementation Committees is greatly appreciated and makes a difference to water quality, to communities and to customers in the supply chain. Kathy spoke of the longstanding relationship between SFI and professional harvesters and how she hopes to continue to grow and strengthen that relationship at the state and national levels. She also thanked OFRI for their continued support of Project Learning Tree which moved to SFI in the summer of 2017. Kathy praised Oregon for their leadership in this space and said we have a shared mission in educating the next generation to be future forest leaders which is increasingly important as 80% of the population is now urbanized. The Desserts for Dreams luncheon was well attended this year, with the charity selected by Oregon Logging Conference First Lady Donna Kriege being St. Charles Hospice. More than $10,000 was raised for St. Charles Hospice program. Delicious desserts and other luncheon fare was donated by many local bakeries and restaurants. For the second year in a row and the third time in four years, Green Diamond Resource Company employee Bryan Chipps was the fastest competitor in the 9th annual Oregon Logging Conference Log Loader Competition. Chipps has also placed first in 2017 and 2015, and in 2016 he tied for second place. It took more than a little rain and cold weather to prevent forest industry families and members of the public from attending the Family Fun and Education activities on the closing day of the Oregon Logging Conference. People of all ages enjoyed activities such as building bird feeders, learning about wildlife, and getting to take home a free tree seedling. Educational activities were held in the Wheeler Pavilion on the Lane County Fairgrounds, and then members of the public were able to take a closer look at some of the state-of-the-art logging equipment on display and talk with industry representatives. The Oregon Logging Conference would not be possible without the generous support of our sponsors, exhibitors, board of directors, staff and volunteers. Thank you to all, for a very successful 80th Annual Oregon Logging Conference.